I knew this, but I forgot it yesterday when I was working on GIRC. 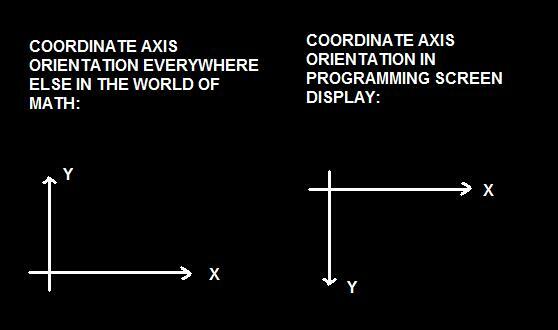 This convention of inverting the y-axis for screen display isn’t peculiar to Processing, it’s common to many programming languages. There is a way to change the convention at the outset of a program, but I don’t know if I want to mess with that. I. Oh, this will be easy! II. Why is this so hard? First I have this flash of inspiration and in my mental image I don’t see all the steps, just the end result. Then I get into the nitty-gritty of writing the program, and I realize I have to do this and that and the other thing and it’s two steps backward for every step forward and the effort rapidly becomes frustrating. Then I get bogged down and come to a complete stop. The cause is hopeless, whatever made me think I could do it? Then I find that there was some trivial bug that is easily fixed and everything runs smoothly. How could I have made such a mistake, and why didn’t it jump out at me the first time I reviewed the source code listing? Finally, I’m done with the finished product, and I forget all the hard work, and it I congratulate myself on being so clever — though in the back of my mind I wonder if I’m losing it, because it took me so long to do it. But then I blame the universe for not being able to calculate 6 x 9 correctly, and get on with life. This entry was posted in Uncategorized and tagged 6 x 9, five stages of programmer's grief, GIRC, processing, screen coordinates. Bookmark the permalink.